in engineering merge into a technological solution full of impressive individual features and details. ONLY is much more than a latest generation technology. It is smart home completely dedicated to you. Total privacy and endless possibilities of customisation bring to life your true personal choice. ONLY is a manifest of sophistication for unique and exclusive homes. These are the devices that control light, shades, climatization appliances and play your favourite tunes. The in-wall versions are installed in the standard wall switch box making it the ideal solution for retrofitting or building renovation. The wall keypads are snapped into these in-wall devices. 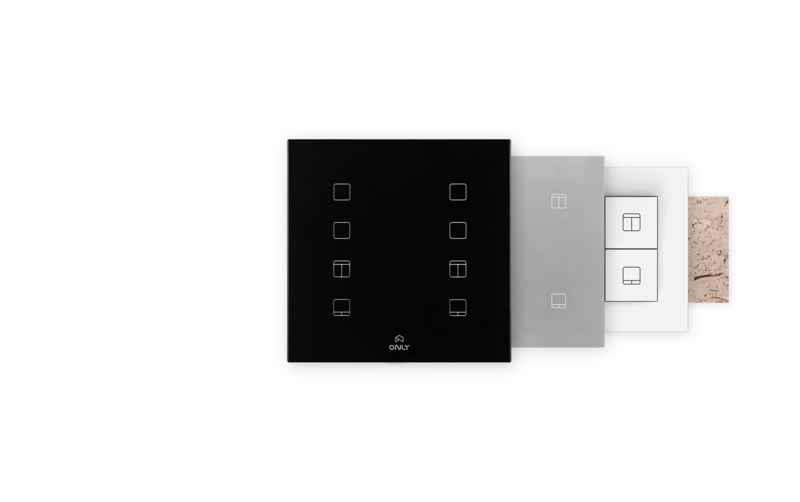 You may choose any keypad model independently of the in-wall device. For a centralized solution, the electric switchboard versions are the best option. You decide if myONLY server is visible or not! Table top version, design coherent with all ONLY Smart Home product line, or the technical version, hidden at the electric switchboard. The wall keypad models are totally independent of the device where they are installed. 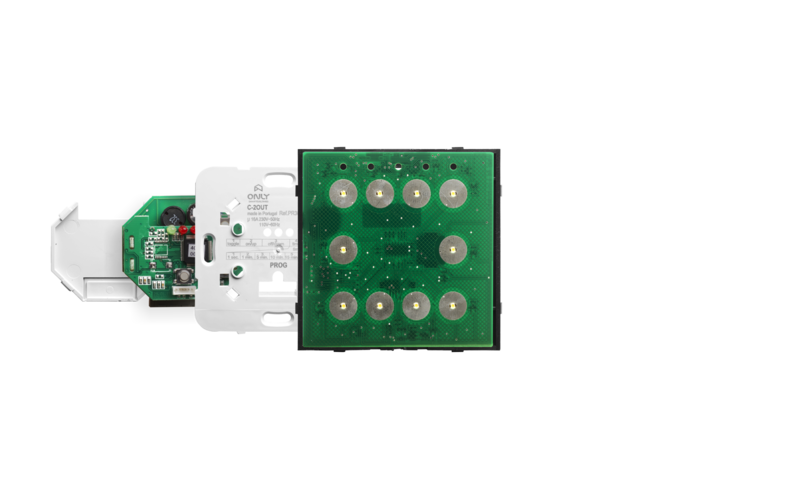 A 9 touch sensors keypad may be installed over a 2 output actuator, and its keys may be used to control any other ONLY Smart Home system actuator. Choose the wall keypad panels that best suites your control needs and interior design requirements and install it wherever you want in the house. Total flexibility to define the actuator needs independently of the wall keypad models that later on will be installed over each actuator. All automation systems need to communicate. The ONLY Smart Home communication infrastructure is based on CAN technology and its reliability. ONLY CAN BUS is installed by adding an extra electrical wire, with the same gauge, providing a highly reliable solution without the extra costs of the dedicated communication solutions. Although invisible, ONLY CAN BUS is one more reason that makes ONLY Smart Home so reliable. Minimal design, with the essential and a subtle beep sound and soft led light for a sensorial feedback or with extra features, equipped with OLED display for an immediate access to setup. Flexibility for finishing colours and coatings, materials – wood, stone, glass, metal – or hidden behind the finishing surface of the walls. Countless icon options for a total customisation. For large projects the logo might also be customised. Intuitive, simple and so complex in the functionalities it offers. With myONLY app all the power of automation is in your hands. An exciting and innovative tech experience, oriented to your comfort, safety and energetic efficiency. Immediate control, scenes and smart events setup, video doorbell, smart lock, etc. All visible including information about the energy efficiency and estimation of your next energy bill… You choose what you want to see.